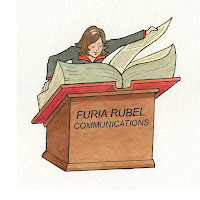 Furia Rubel is pleased to announce the launch of our new PR e-newsletter. We plan to share exciting agency, industry and client news, upcoming events that may be of interest to our readers and a whole lot more on the public relations scene. If you would like to be added to the distribution list for the electronic newsletter, go to http://www.furiarubel.com/contact.php. Please include your name, e-mail address and in the inquiry line, write: subscribe to e-newsletter. (Image by Pat Achilles and trademarked by Furia Rubel).